From what I can tell, New England attracts tourists for two main reasons: the scenery, especially during the changing colours of the fall, and because it’s spooky. You name it, New England has it: witches, ghosts, (alleged) vampires – even UFOs and Bigfoot sightings. The day started at around 5:30 a.m. because we wanted to collect our rental car and get on the road by about 7 a.m. Sadly, someone (…me) forgot their passport, so we had to drive to Brampton from Toronto to get it. Then, someone (Colleen!) had to get American money, so we ended up sitting outside a BMO for half an hour waiting for it to open. Consequently, we didn’t actually start heading towards the border until almost 10 a.m. The border crossing was, of course, busy and took about an hour. We didn’t cross into the U.S. until about 12:30 p.m., but our ‘Salem’s Lot audiobook and a selection of homemade sandwiches and tim tams kept us going. 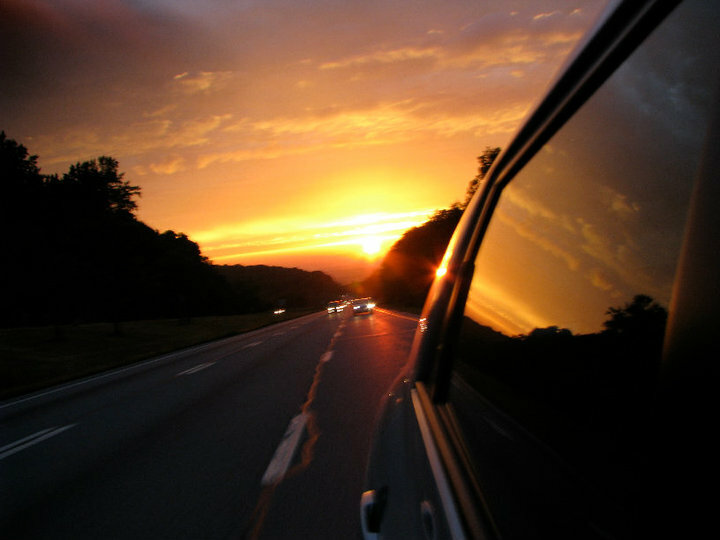 As we continued into the U.S. – passing through endless miles of New York state – we realized we were running really late. To compensate, we may have started driving a little faster than we were supposed to… until a Delaware sheriff pulled us over and gave us a ticket for going 85 mph in a 55 mph zone. Oops. We went slower after that. So we didn’t get to our first stop until well after 8 p.m., although we had wanted to arrive before sunset. That meant we ended up exploring the aptly named Holy Land USA – an abandoned Christian-themed amusement park in Waterbury, Connecticut – when it was dark, which made it extra creepy and extra hard to take photos. It was, however, well worth the stop. Random cats stood guard all over the place, shadowy religious statues peeked out from behind bushes, and ‘No Trespassing’ signs added to its allure. We, however, didn’t want to get roughed up by any more cops – and it was getting really late – so we soon left. Before getting back on the road, we stopped to pee in a nearby mall only to be accosted by one of those crazy high-pitch signal things that only young people hear, which some places broadcast to drive us away. Since it was closing time at the mall, we had to tolerate that noise because – apparently – we’re still young enough to hear that. Dammit. During the last few hours of our drive into Salem, MA, we ended up getting pummeled from above by a torrential downpour, a result of stupid Hurricane Earl further south. So, if you’ve been keeping track, we’ve been awake since 5:30 a.m., on the road since 7:30 a.m. and now we’re driving – about 16 hours later – through a terrifying sheet of rain in a foreign locale. Day Two: Witches, Ghosts and UFOs, oh my! We spent the better part of Saturday exploring Salem. 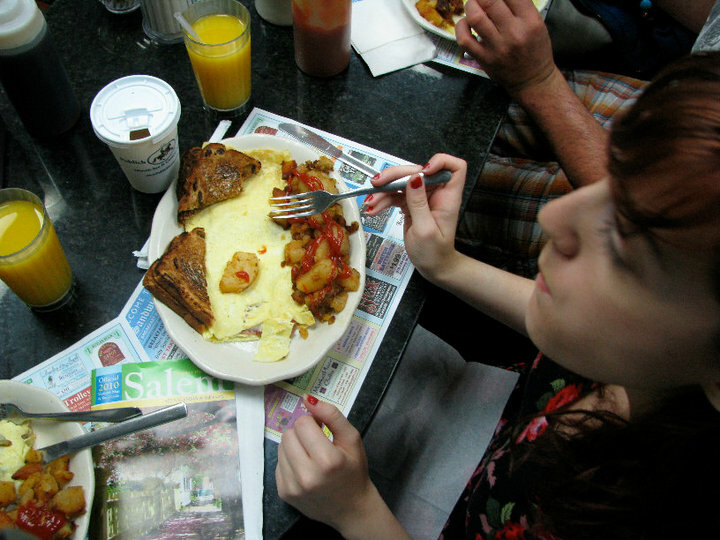 We had omelettes and hashbrowns at the counter of a very happening diner called Red’s and then, with the weather on our side, we parked the car and walked the city. We hit up the Salem Witch Museum where we heard the history of the Salem Witch Trials in what can only be described as a giant diorama; visited endless witch shops with potions, crystals, incense, wands and nearly every one offering readings (we heard a lot of Enya); participated in a live spell casting with a witch named Lady Willow in the back of the Salem Witch Village (where they were playing Practical Magic on a TV); and visited the Memorial for the 14 women and 6 men who were killed during the witch trials of 1692, as well as the neighboring Old Burying Point where tombstones stood cracked and falling apart. 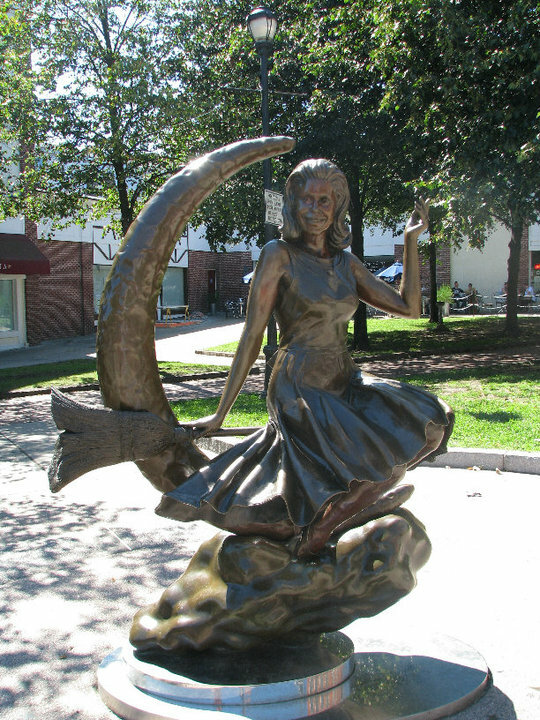 Salem is a veritable Mecca for witches of all kinds. There’s an interesting dichotomy there: really kitschy witch attractions side-by-side with respectable, practicing Wiccans. What’s especially interesting is that although it’s generally accepted that there were no actual witches during the famous witch trials – just some young girls on very low levels of LSD – the city has managed to attract a huge number of practicing witches. As a bit of fun trivia, you shouldn’t call male witches warlocks – it actually means “traitors”. Go figure. Near the end of the day, I had my tarot cards read by a second degree Wiccan priest named John, who told me that I should be – nay, that I need to be – writing creatively, not as a journalist. When he placed his hands over mine and meditated, he said he saw a mountain with bright shades of pink and purple. He said that I dream big… I liked him. 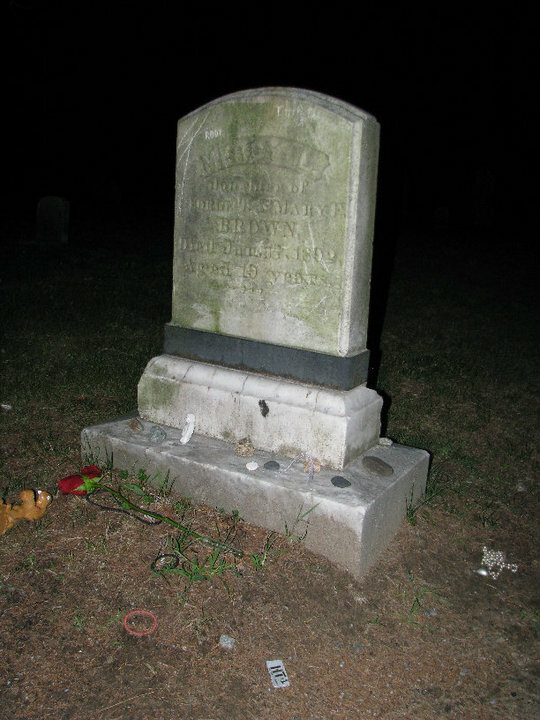 With time to spare, we drove an hour further south to Exeter Rhode Island, where we had dinner at the Middle of Nowhere Diner, and then visited the grave of alleged vampire and supposed ghost Mercy L. Brown at the Chestnut Hill Baptist Church Cemetery. Full story here. Trying to find that grave in pitch dark wasn’t easy, but we did – without any ghostly encounters fortunately… or unfortunately. I still haven’t decided. Arriving back at the B&B around 10 p.m., we were able to participate in a seance conducted by a psychic (who was, oddly, named Lizzie) who does so every Saturday night for $10 a head. There was a family there who also participated. Sitting around a tiny table in the dimly lit room where Mr. Borden was murdered, the psychic had us place our hands on the table (to channel our energy to the ghosts) and communicate with them by way of tapping or tipping over the table (the ghosts, not us) with the psychic acting as translator. And, boy, did we get a show. That table tapped and tipped without fail, and we had a whole conversation with Mr. and Mrs. Borden (as well as another ghost named Joseph who happens to live in the basement and a couple of children ghosts). I don’t know what was actually going on there, but it was certainly entertaining. 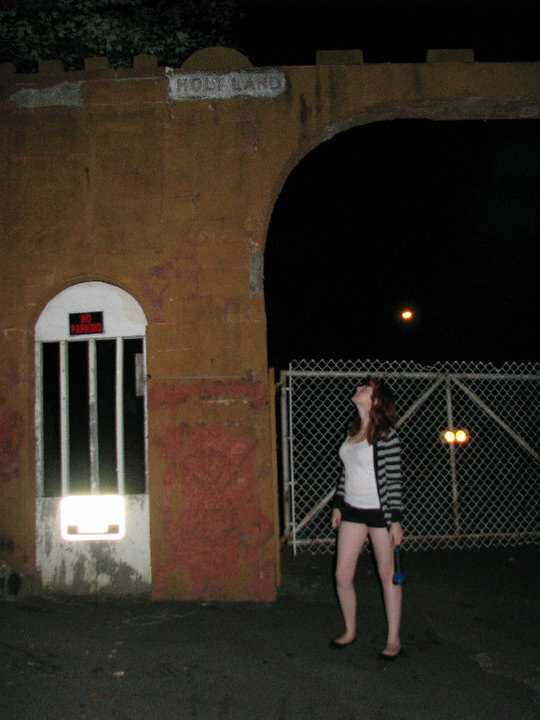 Eventually – after taking a bunch of photos in an attempt to capture ghost “orbs” (on Colleen’s camera) – the psychic left and we made a quick trip before bed. Apparently (although it’s WIDELY discredited) the area near Fall River is referred to by some as the Bridgewater Triangle. Here, people have reported everything and anything weird and supernatural – ghost sightings, UFOs, Bigfoot sightings, etc. etc. So we drove towards Dighton Rock (a weird rock with strange petroglyphs) in the hopes of seeing a UFO or anything, really. Sadly, someone (Colleen!) got a bad vibe once we got there (it was almost midnight and nearly deserted out there, to be fair) so we didn’t actually see the rock or stay very long. I had one hell of a fright when we were standing outside the car and Colleen suddenly pointed her flashlight near me and said “what was that? ?” Needless to say, we got in the car and got out of there. Sleeping in the Lizzie Borden house, though a little creepy, proved uneventful. Even so, I have to give Saturday a solid ‘A’ for creepiness. Not realizing how breakfast at a B&B works, we were 15 min. late for breakfast and consequently missed the johnnycakes – an essential part of the breakfast that the Borden family ate on the morning of the murder. Unfazed, we bought some matching silver hatchet earrings from the gift shop and left Fall River. 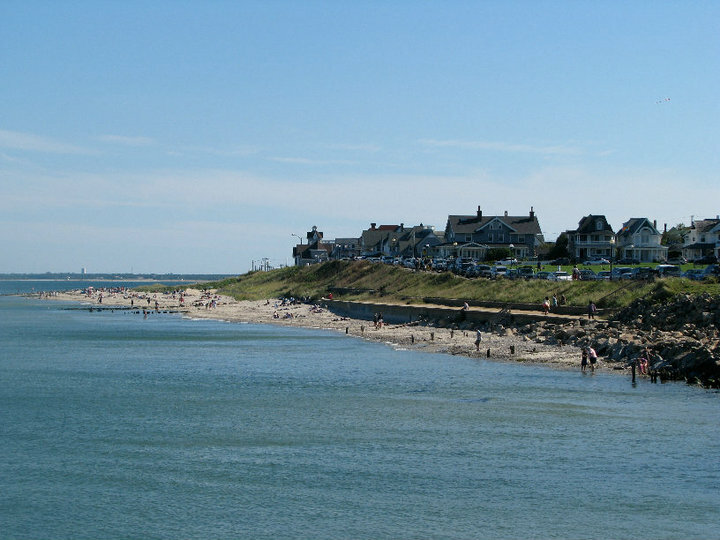 We drove about an hour east through Cape Cod to catch the ferry to Martha’s Vineyard. Unfortunately, upon arriving at Woods Hole, we were told to drive back almost half an hour the way we had come to park somewhere and take a shuttle to the ferry. Lame. So we missed the ferry we wanted to take, and had to take a later one. As a result, our time in Martha’s Vineyard was a bit rushed. The 45-min. ferry trip was very pretty though, and Martha’s Vineyard is gorgeous in a very rich and crowded way. We hustled our way through the crowds to have lunch at the Slice of Life Deli, where I ate a fried green tomato sandwich (!) and then we took a bus down to Edgartown, where Jaws was filmed. We only had a little while to sightsee, and then we had to head back to catch the ferry. Though short, my only real regret was not trying the lobster ice cream. Seriously. Back on the mainland, we started our 3.5 hour journey north to Rockland, Maine. Unfortunately, our mishap with the ferry meant we were running late. As a result, we couldn’t stop to visit Jack Kerouac’s grave in Lowell, MA. *tear* Next time. Still running late, we had to stop for dinner in Portland, Maine, where we ate at a really nice restaurant called Street & Co., where we had crostini with a type of goat cheese called miticana and peach preserves to start, a main (or, Maine!) course of whole lobsters on fettuccine, and a rich chocolate and hazelnut cake for dessert. 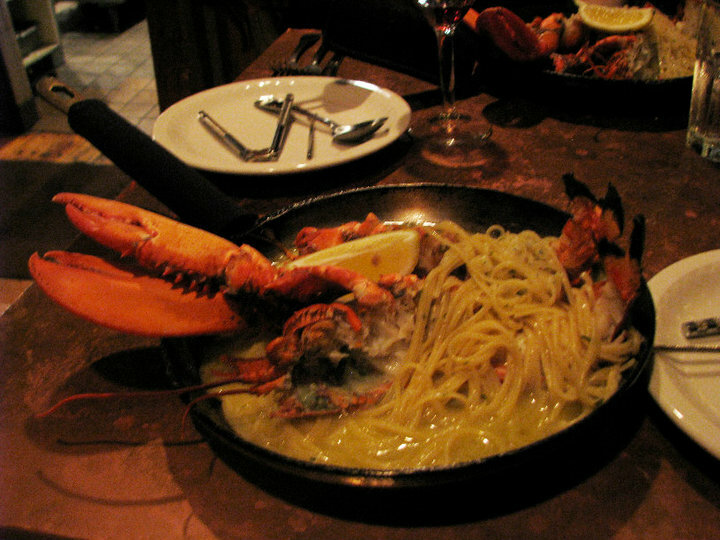 I loved it, although Colleen felt uncomfortable with her lobster, which she described as both disgusting and delicious. It probably wouldn’t have been so bad if it hadn’t come in its entirety – antennae, spindly legs, eyes and all. 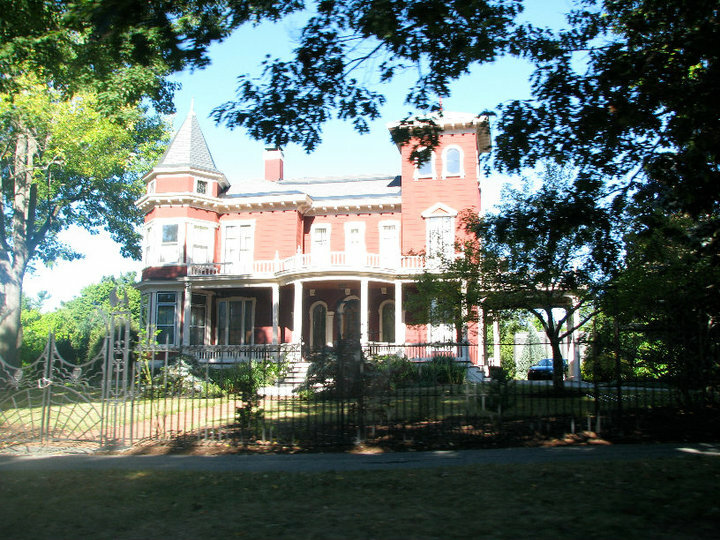 We finally reached Rockland around midnight and checked into the supposedly haunted Captain Lindsey House Inn. The inn was gorgeous, and the people are just the nicest ever. They had free cookies and other snacks available and little chocolates in our room. Unfortunately, we only had time to enjoy the four-poster bed and fancy furniture for a little bit because we had to get to bed early – tomorrow we’d be driving all the way back to Toronto. Appropriately, we listened to Jack Kerouac’s On the Road while driving back from Rockland. We took the more scenic, northern route over Lake Ontario via Montreal this time. Driving along the scenic Maine coast, and through the winding mountains in the north, it was a much more enjoyable drive than Friday’s trip. We also had no troubles with traffic, despite the fact that it was the tail end of the long weekend. At one point, we listened to the opening music from The Shining. Also of note: There was a house along the coast with a mailbox of a normal height, next to another mailbox that was about 10 feet high that read “BILLS” on the side. Ha! 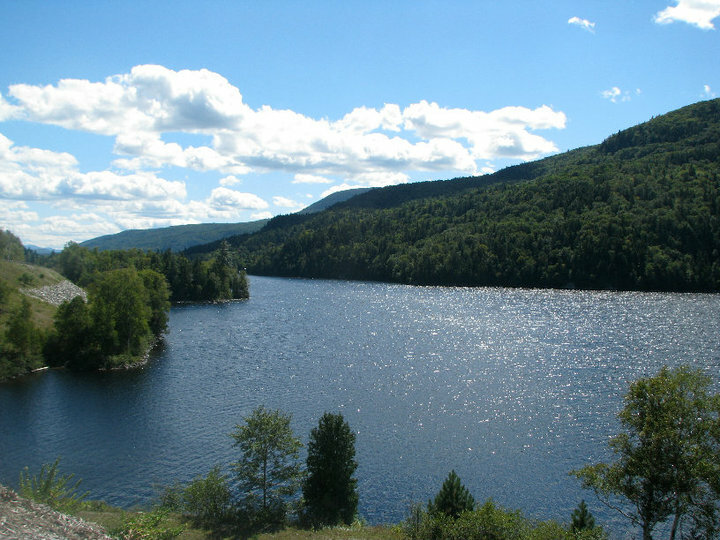 Crossing the border into Quebec went like this: Driving, driving, driving… Oh, what’s this? A little building and a guard? I guess this is the border! There was seriously no one ahead of us, so we just pulled up to the border guard, and passed through a minute later. Best. Border Crossing. Ever. The rest of the drive through Quebec and Ontario was largely uneventful, and the traffic as well as the weather cooperated for the most part. Unfortunately, though, there are a whole series of Ontario Service Centres that are under construction so we were unable to get food where there was supposed to be food. Lame.